We Have Developed 400 Professional Websites Last Year ! In today's global economy, businesses are going far beyond their shores to look for good resources at an affordable cost to retain their competitive edge. Bangladesh also offers excellent trained and high caliber accounting professionals at affordable rates. Currently Bangladeshi Accountants are ranked as one of the best in their business. Major Corporations, Multi National Companies and large consulting firms have already set up their own businesses in Bangladesh including accounting divisions and are saving substantially on their overheads. Now, you too can have your accounting done online, offshore and by highly qualified, trained and Certified Accounting Professional Partners and achieve the same levels of savings. Hire the services of a Bangladeshi Accountant without the hassles of checking immigration status or direct overheads to the company..
� Excellent manpower, qualified accounting professionals, well trained in QB, Peachtree etc. � State of the art facility with excellent network connectivity, power back up and working space. � Ability to scale-up operations. � Proven process management, methodology, stress on quality work, cost effectiveness and confidentiality of data. � Separate full-fledged training centre meant for continuous updating of our employees. � Located at heart of Dhaka the capital city of Bangladesh the fastest growing nation in the IT sector in South East Asia, the availability of large pool of English speaking, skilled workers, and Time zone advantage. � High speed 24x7 Internet access through leased line with ISDN backup. � UPS & IPS support for continuous power supply. � Firewall with VPN providing high security for your code and data. � High speed, high capacity servers. * Focus on your core activities by passing your Accounting activities and problems to us. * Enjoy economies of outsourcing and increase your bottom-line. Our clients enjoy nearly 40-50% savings in costs of maintaining accounts locally. * Availability of accurate accounting data at any time. 1. Set up Manager module automatically installs the client side software on End user client, Client and Accounting Professional Partners computers. 3. 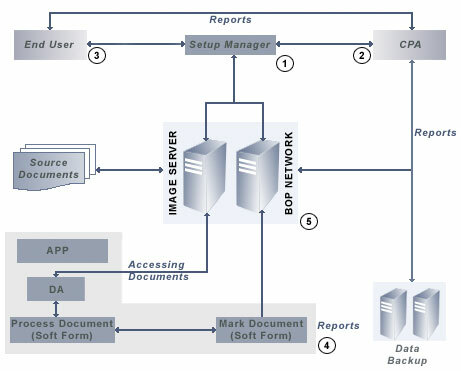 Data Entry agents access the image server and the application servers to posts Company data and / or update the records. 4. Client is notified of the changes and the updated records are flagged for Client review and approval. 5. Client then validates the data entry and makes necessary filings. Copyright � www.devoteeinfosys.com. All rights reserved.